When selecting a good Kid Friendly restaurant it is important to find an atmosphere that will keep your kids intrigued / entertained. Many Kid Friendly restaurants also have great attentive staff that keep the kids in mind when taking orders and refilling drinks. 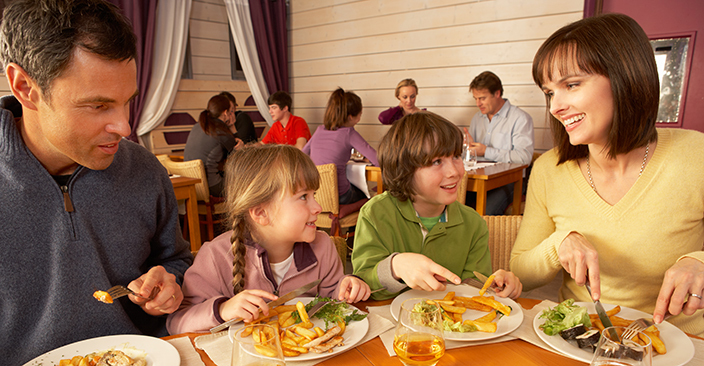 Kid's meals, cups with tops and coloring books and games are also a addition to making a restaurant Kid Friendly. At Rainforest Cafe, we cater to kids. Our loveable Cha! Cha! and the Wild Bunch are here to make sure children of all ages have a great time while exploring the rainforest. The Dog of Nashville first opened it’s doors in January of 2007 and has quickly established it’s self as a local fixture in the Nashville dining scene. A meal at The Old Spaghetti Factory is more than a meal. It’s an experience. Located in the heart of historic downtown Nashville on 2nd Avenue this is a place you can afford to bring the entire family. Hi, we are Dena Tripp and Debra Shwetz, the founders of Nothing Bundt Cakes. When we began Nothing Bundt Cakes in Las Vegas in 1997, we wanted nothing more than to please our family and friends. Hibachi Grill and Supreme Buffet is the largest restaurant in Nashville and the surrounding areas. They have a wide selection of favorite foods including Chinese, Japanese, American, Italian and Mexican items on their supreme buffet.